Andy H: It's a close call this week as two titles contend for top spot on my to-read pile. 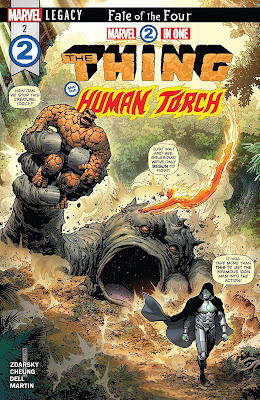 Will it be Marvel Two-In-One #2, the 'non-Fantastic Four comic that really is a Fantastic Four comic' or Southern Bastards #19 which I was beginning to worry would never, ever, see the light of day? I'm still undecided but both are eagerly anticipated. The Thing and the Torch travel to Monster Island in search of the secret of Reed Richards, and Doctor Doom is hot on their heels. This issue features a familiar looking cover, which FF fans should lap up. Chip Zdarsky and Jim Cheung are making this a must-reed *ahem* -read. It's been almost four months since the last issue of Southern Bastards but it's so good I can forgive Jason Aaron and Jason Latour for that. Roberta Tubb is a force to be reckoned with and, love him or loathe him, Coach Boss is a stand-out character. Please don't leave it too long for #20! Talking of love or loathe, it's Doomsday Clock #3. People are still debating the pros and cons for this book but for me the Gary Frank art will win out, every time. Avengers #677 continues the weekly 'No Surrender' story and it's the return of Quicksilver that is the highlight of this issue. Manifest Destiny #33 is another Image title I'm looking forward to. Like Southern Bastards, I've really enjoyed the way the characters have been crafted and Manifest Destiny still manages to spring plenty of weird and wonderful twists and turns in its storylines. Matt C: Doomsday Clock #3 is the book I'll look at first; the first two issues hinted at potential it hasn't achieved yet, but it's still early days. Whatever your opinion on the series' existence, it's pretty clear that neither Geoff Johns or Gary Frank are in it for the money; they're bringing their A-game to the proceedings. I'm more confident of getting the required thrills from Marvel Two-In-One #2 as the debut was pretty special, and half the Fantastic Four together again is far better than none (also: that cover!). Southern Bastards makes its return on Wednesday; the recent scheduling has been erratic to say the least, but it proves to be worth the wait, every time. Thanos #15 deserves some attention too as Donny Cates and Geoff Shaw are doing some significantly entertaining things with the Mad Titan, and their tenure on the title has been a delight so far.